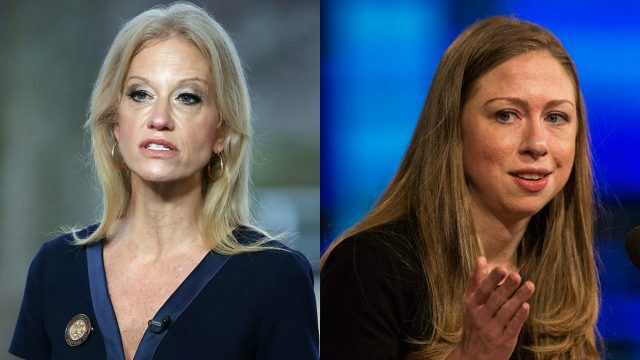 Kellyanne Conway did not take Chelsea Clinton’s criticism of her sitting down. Hillary Clinton’s daughter ripped President Trump’s senior adviser after she incorrectly cited the “Bowling Green Massacre” — an event that didn’t happen — while defending his executive order restricting immigration. Conway later clarified that she mean to say “terrorists” in reference to the two Iraqi citizens living in Bowling Green who were arrested in 2011 for trying to send weapons to al-Qaeda in Iraq. After Clinton asked Conway “please don’t make up attacks,” Conway reminded her that her mother lied about being under sniper fire when she landed at an airport in Bosnia in 1996.